The HP Elite x3 is one of a few phones to run Microsoft’s latest mobile operating system (OS), Windows 10 Mobile. If you’re familiar with the desktop OS, the mobile flavor can be best described as a handheld Start menu. It’s wall-to-wall tiles. As you can on Android and iOS, you can tweak what’s on the home screen, including the wallpaper, apps and their size and location on the screen. No matter how much or little you fill the screen up with tiles, there exists a small “all apps” button that takes you to a full list of apps and utilities built into the device. To manage apps, press and hold the back button that’s nestled alongside the Windows button near the bottom. If you want to search for something on the device or the web, Cortana is more than happy to help through tapping the magnifying glass button. And, if you want to enable the easier-to-manage one-handed mode, press and hold the Windows button. Smartphone users of any OS allegiance will feel at home quickly on W10 Mobile, and, for what it does, it does so reliably. Hopping between apps, surfing the web and doing simple tasks – like taking photos, texting, and taking calls – are simple on Microsoft’s universal mobile platform. Where this OS falls short is with its app selection. It leans on the Windows Store, which currently offers a library of apps that is barren compared against the Apple App Store or Google Play Store. Despite hopes of a broader app offering by way of the Universal Windows Platform, things still aren’t looking good – especially for anyone thinking of switching over from Android or iOS. Chances are you won’t find the first-party app you love, but you might (even then, it’s a maybe) find a decent third-party substitute for it on the Windows Store. Not the best look, Microsoft. The HP Elite x3 is powerful enough to handle anything you throw at it, whether it be multimedia content you’ve purchased through Microsoft’s Windows Store or stuff you’ve loaded from your computer or the cloud. Using the Elite x3 as your driver has its share of ups and downs. In the case of music, you’ll be treated to dual front-facing speakers powered by Bang & Olufsen that sound surprisingly rich, as well as a 3.5mm port on the device’s top if you want to listen privately. In terms of music subscription services, Microsoft’s own Groove Music and Spotify are the best options, if only because Apple Music and Google Play Music simply aren’t available. When it comes to video, the 2,560 x 1,440 AMOLED display with 494 pixels per inch (ppi) really shines. While watching Hulu, Netflix or a video purchased through the Windows Store, visuals are crisp and the vibrant colors pop but remain true to life. Additionally, the colorful interface and tile layout lend well to the high-quality display used here. The Elite x3 is well-equipped to tackle as much gaming as you can muster. The internals, which we’ll get into in a moment, can handle any game on the market currently – so long as it’s on the Windows Store. Compared to its wanting selection of popular apps, there is actually a healthy amount of games to choose from. Lastly, internal storage for multimedia won’t be much of an issue. On top of the 64GB of built-in flash storage, HP has included a microSD card slot to ensure that you don’t run out of space for pictures, videos and apps. HP’s smartphone stacks up to the latest flagship Android smartphones in terms of hardware, bringing to the table a Snapdragon 820 chipset along with 4GB of RAM. However, unlike Android phones, there’s no standardized way of reliably benchmarking Windows 10 Mobile devices. The only reputable benchmarking app available, AnTuTu Benchmark, is still in beta on this OS. All said, a phone’s general performance speaks louder than a benchmark number. During our tests, whether the Elite x3 was used alone or hooked up to a monitor via Continuum, multitasking was a delightfully smooth experience. Even if Continuum doesn’t turn your phone into a full-fledged PC beat-for-beat, it’s still a nifty feature nevertheless. In the US, UK, AU and many other regions, you can pick up the HP Elite x3 with its Continuum-enabling dock, which features two USB 3.0 ports, a USB-C port, a DisplayPort for visuals as well as an Ethernet jack for a wired internet connection. For those in the office, it also features a Kensington lock slot, which will allow you to secure it to your desk or cubby. This dock matches the aesthetic of the Elite x3, and includes several face plates to make it work best for your setup and work style. For example, one of the plates is wider than the default to fit the phone, should you get one of HP’s official phone cases. Another has a USB-C cable branching off of it, allowing you to keep the phone up to your ear all while it’s connected to your monitor. If you’re on the go, you’ll be happy to know that the HP Elite x3 supports Miracast, a technology that allows it to beam information to a screen wirelessly. This will work on any Miracast-capable display, including HP’s own Lap Dock, an accessory that funnels the Elite x3’s powers into a laptop form factor. If you want this 12.5-inch laptop accessory, it’ll set you back an extra $599 (£643, AU$799). As mentioned previously, HP hasn’t yet released this add-on in regions outside of the US, but we’ll update this section should that change. As noted earlier, Continuum works as intended, splashing Windows 10 as you know it onto your monitor. However, it works a little differently under the hood. Whereas your traditional computer can run x86 and x64 applications, Continuum doesn’t support them natively. So, programs like Google Chrome, iTunes and Slack won’t work unless there’s an ARM-compatible version available on the Windows Store, which there likely isn’t. To work around this, HP offers a unique, cloud-based solution called HP Workspace. This gives users virtual access to any 32 or 64-bit application that you’d normally be able to install on a traditional Windows 10 laptop or desktop. However, it’s priced at a per-user basis and is clearly not aimed at your average customer. Pricing for Workspace starts at $49 (about £39, about AU$63) per month and, at this level, it allows users access to a virtual machine that has 4GB of RAM. For the price, HP only allows 40 hours of use per month and a limit of 10 apps to virtualize. If you want to pay more – up to $79 per month – you can virtualize as many apps as you’d like. We’ve tried out Workspace, and it’s definitely a unique solution to the app shortage experienced on Windows 10 Mobile. Users can specify to HP which 32 and 64-bit applications they’d like to use within the virtual machine. It also allows you to connect cloud storage from the likes of Box and Google Drive, which you wouldn’t normally be able to find on Continuum alone. As it’s a virtual machine, you can expect a little lag. The feed we were trying pumped through a near 1080p signal, but at 15 frames per second. This is totally fine for typing documents and e-mails, but much less serviceable for streaming video. The fact that this can all be done with the Elite x3 alone is impressive, but these extraneous elements required to unlock its full potential quickly become pricey and convoluted to the point that most people will be better suited by poone of the best laptops running Windows 10. Without HP Workspace, we’re left with Microsoft’s suite of productivity apps, Skype, Microsoft Edge and an unclear number of additional apps. There is currently no way of knowing what will be compatible until you search for an app in the Windows Store. Again, if Microsoft’s Universal Windows Platform picks up speed, we could see more Continuum-supported apps coming soon. But, that’s a really big “if”. This is less a slight against the Elite x3 itself than it is against the footnotes of the ambitious, if slightly misleading Continuum feature. 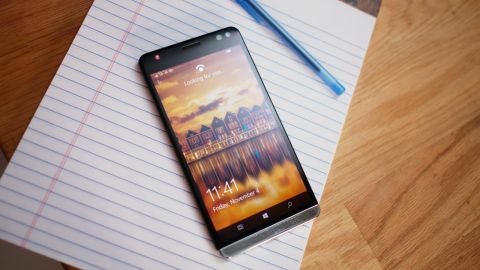 All Windows 10 Mobile phones suffer a similar fate in the transformation from phone to PC, but, so long as your needs are limited to Microsoft’s productivity apps and a few select others, connecting to a monitor will be a huge perk. We first saw the iris-tracking biometric feature known as Windows Hello used in Microsoft’s own Lumia 950 and Lumia 950 XL, and it’s nice to see its return on the HP Elite x3. In addition to setting up a fingerprint for secure entry, you can hold the phone a few inches away from your eyes to log in. It’s a nifty trick that we’ve begun to see trickle into the Android world with the short-lived Samsung Galaxy Note 7, and it’s rumored to show up in the LG G6, too. You don't have to hold the phone close for it to recognize you. As Matt Swider said in his review of the Lumia 950, Windows Hello is definitely novel, but it’s a slower method of logging into a phone than simply holding a finger to the fingerprint sensor. If your information requires the utmost security, you’ll appreciate Windows Hello more than most, and the sometimes-sluggish feature won’t change your mind about that. Current page: What's it like to use?